V.com weekend vote: Which 'Olympian' feat would you want in the Violin Games? 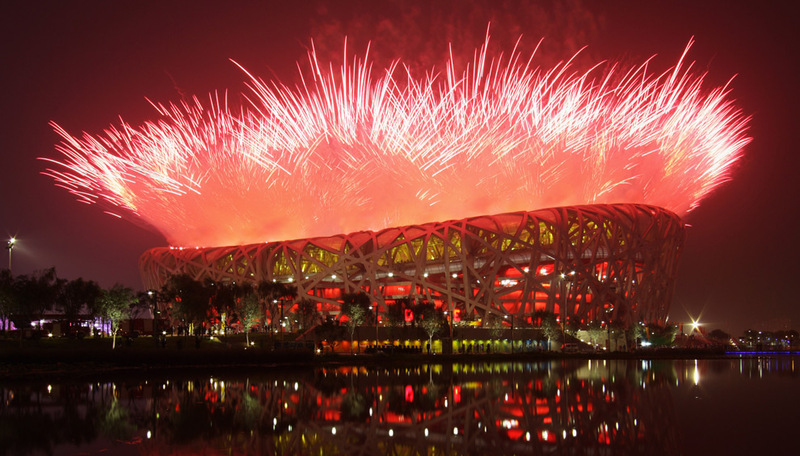 The brilliant opening ceremonies for the 2008 Beijing Olympics got me thinking about over-the-top, gargantuan feats, for some reason. I wondered, what would the events be in the Violin Games? I'm thinking that the Violin Games (V.G.) would take place over the course of a week, so all events would have to take place in that time. The time element is part of the challenge, I'd say, with the V.G. One event would certainly have to involve playing all 24 Paganini Caprices, as in having them in hand and performing them all for an audience. And then, there's playing the Bach Sonatas and Partitas, but I thought it would actually be harder to record those then to play them live. Why? Because in recording them, you'd be casting them for the record; your decisions would have to have a certain non-spontaneous finality. Making final decisions regarding Bach (deciding how to play it "right") to me is every bit as hard as just physically doing it. Then I thought I'd throw in a teacher event: leading a group of students through all 10 Suzuki violin books. But the teacher has to play every bit of it by memory, no cheating! Recall the Handel Sonatas, the Bach concerto, weird arrangements of other pieces, two Mozart concerti and a whole lot of little short pieces that need to follow certain bowings. Then, for the orchestral musician, how about a little Richard Strauss: playing Don Juan, Tod und Verklärung, Till Eulenspiegel, Zarathustra, Don Quixote, and Ein Heldenleben all in one marathon concert? (I actually played in a concert where the orchestra did three of those works. It was ridiculous. Insane!) And if, instead, you'd prefer the opera pit, I threw in a complete performance of The Ring cycle. So which event will you be participating in, or following? And if you have more ideas for Olympian violinistic feats (or just hellish torture), please describe below. And of course, if you have actually completed one of these tasks (as mortals occasionally do), please do share! what about playing all of Haydn's string quartets? Here's the Guitar Olympics, the real deal. I think I read Groves, or maybe it was the Cliff Notes, one or the other. I'll do with the Violin Olympics as I do with the sports Olympics: stay at home and watch TV or internet. Let's have a competition of Études Polyphoniques, though! All six of them, of course, to be played on six successive days. I'll be spectator. And for the opening ceremony: it would not be too difficult to find 2008 little fiddlers to play Beethoven's Ode an die Freude. Or a Flight of the Bumblebee speed contest? In order to make good use of all these VSO on Ebay, I'd like to see the VCOM version of the hammer - just how far can you launch a fiddle? Bows, on the other hand make really cool and very aerodynamic javelins, would a Tubbs fly further than a Lamy? Must we allow fibreglass bows to compete? Does rosin application improve flying performance? We need a sprint event too, so get these Flights of the Bumblebee up to world record speed. Indeed, everyone is right. These are all basically long-distance events. The Bumblebee idea would work nicely as a "sprint," plus maybe we'd stop arguing about who really truly has the fastest Bumblebee. As for launching the fiddles and the Codabows, yes, it seems a little "X-Games"-ish. But why not? But no one is allowed to launch a Strad. Please! As for proclaiming a winner in the shoulder rest debate; I don't think anyone's ever going to get the gold there. There will ever be two sides! I love Bart's suggestion of having 2008 little fiddlers play Beethoven's Ode an die Freude. In every sport/violin competition we see/hear the popular baseball/Paganini caprices and the 100-metersprint/Bachpartita's. The most importent thing of the sport/violin -Olympics is that you also see/hear rare sports/pieces you normally never see on television or sporthall/concerthall. I also like to see rowing in different boats/see all Paganiniconcerts1,2,3,4,5,6. Ruggiero Ricci used to program a recital series (saw it in Bflo a few years back) wherein he did all the Paganini on the 1st half and all the Bach on the 2nd.....They weren't Hahn perfect but he never was. In his 60's, did everything senza sheet music, and is such fun to watch....Much better than Beach Volleyball, Synchronized Diving, or 152 miles of biking in the rain. I voted for the 'Bach Event' because the Olympics are not only about athletic strength and stamina but also beauty in motion. That is Bach. Laurie, you come up with some wonderful, whacky ideas. I think this is the greatest yet. I really like the colored violins, too. I'm happy that ,"Use a Violin in the Hammer Throw" is not on the list!